From the moment the B.O.A.C. Stratocruiser taxied up to the International Air Terminal at Idlewild, James Bond was treated like royalty. – Live and Let Die. This is one case where the old days were definitely better. More comfortable at a minimum. Bond enjoys the luxury of the stratocruiser, flying it also in Diamonds Are Forever. Two days later, Bond took the Friday Comet to Montreal. He did not care for it. It flew too high and too fast and there were too many passengers. 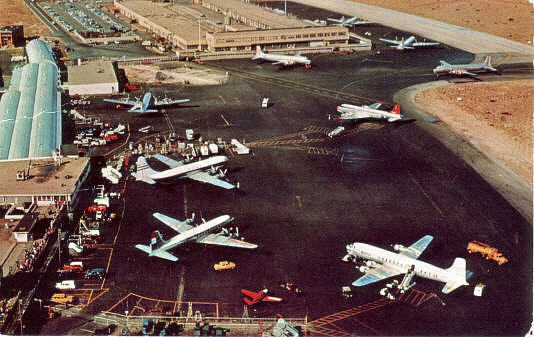 He regretted the days of the old Stratocruiser — that fine lumbering old plane that took ten hours to cross the Atlantic. 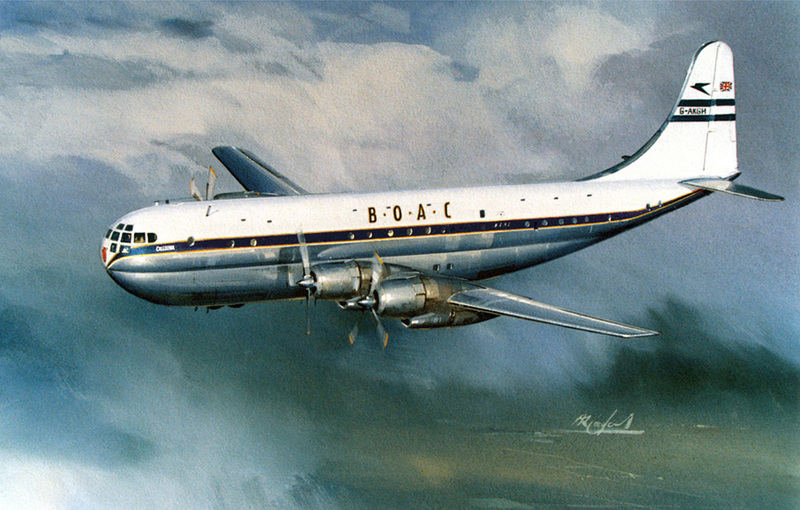 Then one had been able to have dinner in peace, sleep for seven hours in a comfortable bunk, and get up in time to wander down to the lower deck and have that ridiculous BOAC ‘country house’ breakfast while the dawn came up and flooded the cabin with the first bright gold of the Western hemisphere. Bond feels everything is too rushed on the Comet. At the end of Goldfinger, Bond is a captive aboard a Stratocruiser hijacked by Goldfinger and his crew. 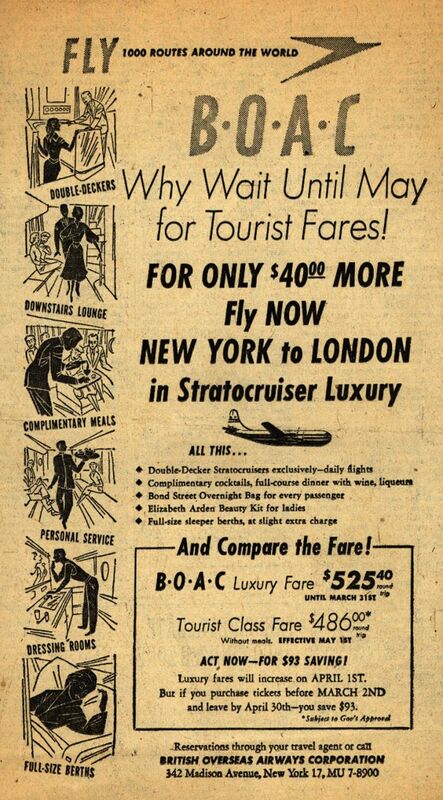 This 1952 ad gives you a feel for the experience. 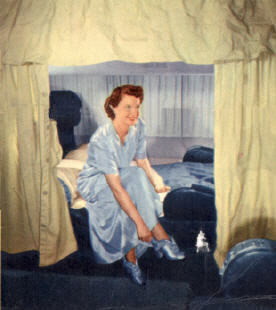 Preferring instead to have a drink in his seat, or sleep in a private berth. (Though in Diamonds Are Forever, Bond notes that he booked too late to get a sleeping berth.) Young lady presumably not included. 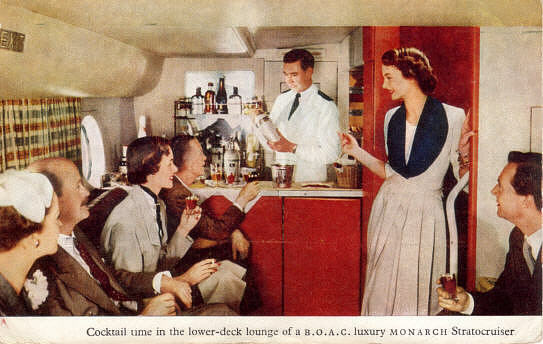 For much, much more on this plane and wonderful era in airplane travel, check out this page.